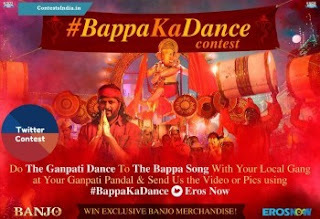 On this Ganesh Chaturthi you can participate in Ganapati Dance with Bappa Song Contest. This contest is on Twitter and conducting by EROS Now. All you have to do the Ganapati Dance to The Bappa Song with your local gang at your Ganapati Pandal and just click a video or picture. You could win exclusive Banjo Merchandise. For videos you can upload it on Youtube and save your video link. This contest is ending soon. Participate now and win prizes.